I spent most of the morning working on lesson plans for our next grading period. In January, we will be starting our 4th grading period for our homeschool year. We started late July and will end late May. We work for six weeks (one grading period) then take a week off. We follow that rotation six times which equals 180 school days for the year. The week off every six weeks is very much needed (especially for my sanity). :) Our holiday breaks this year are one week at Thanksgiving, 3 weeks for Christmas, and the week after Easter. With the frequent breaks we do have to start earlier in the year (July) but the breaks are so beneficial. I really like this schedule and plan to follow something similar next year. Also, it just so happened that our week breaks landed on the kids' birthdays. So, each kiddo is off the week of their birthday - Happy Birthday!!! **Bonus - my birthday is the day after my daughter's so the teacher is also off the week of her birthday! I love reading various blogs and talking to other homeschool moms about how they organize their lessons. I would consider my form or organizing very traditional and structured. Our family seems to work best with lots of structure. I begin with my lesson plan book and plan for the entire grading period all at one time. There are times when I have to change lessons or take a little longer if a concept is not being picked up by my child. However, for the most part we stick to the lesson plan book. I tend to be a bit type A (yes, I admit it) and staying on schedule makes me relax - as much as a type A person can relax. :) Which is probably still pretty uptight compared to most people. This is "the book". Usually, Friday's are reserved for CO-OP. We are part of an amazing Christian CO-OP and we LOVE our Friday's. I do not teach in our home classroom on Friday's unless (like this picture) it is not a CO-OP week. Each child has two columns. On the third column of the first page, I write down appointments or extra curricular activities. This way, I am not having to run and get my personal calendar when we are already upstairs in the classroom. This image is hard to see, but the small markings in red or hot pink are grades that go into the grade book (Excel spreadsheet) for report cards at the end of the grading period. Many homeschooling families do not keep grades or report cards - and that is perfectly fine. However, for my family, remember we need structure. The grades are my way of keeping track of progress and mastery. Also, my kids take their grades very seriously and I want to keep it that way. If a 100 is not made on a test, worksheet, quiz, etc. then we take the time to go back and work on that assignment until the concept is mastered. This is such a glorious part of homeschooling - it is completely geared toward the individual child. If he or she needs more time - great! If they are cruising along we do not stop to wait - we move to the next assignment. I love this part of homeschooling! From the lesson plan book, we move to Assignment Sheets. I have done these sheets a couple of different ways. I have run around like a chicken with its head cut off telling each child what each and every assignment should be. That led to the kids waiting around on me while I was working with another child. It drove me crazy and felt like we were wasting time. I have written the assignments down on notebook paper and spiral notebooks. That system worked fine and I would use it again. Currently, we are using the assignment sheet you see below. 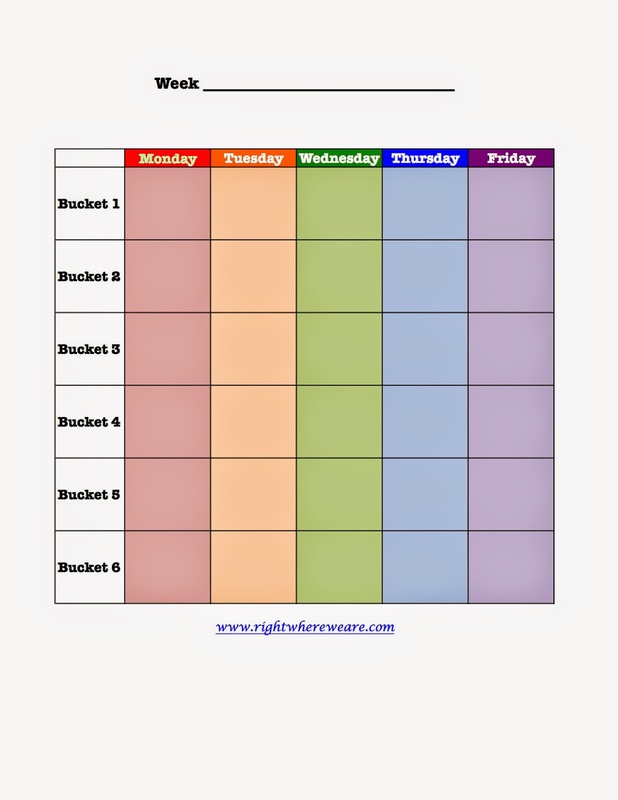 I use "the bucket" or workbox system (will discuss more in a minute) so the sheet corresponds to the buckets and days of the week. I can print a blank sheet for each child for each week and fill in their assignments. For the boys, this keeps them on track and organized. Also, if I am working with their sister, they can move on to the next subject and assignment without having to wait on me. The sheet is placed on their desk at the beginning of the week to be used Monday through Friday. I have a blank version of this sheet at the end of this post for anyone who would like to print and use it. Workboxes, work stations, buckets, whatever you want to call them - they are the nuts and bolts of our classroom. I wish I could take credit for this idea but it is used by many homeschooling families and it works really well. We call ours workboxes, "buckets". I have no idea why, that is just what stuck with my kids. Both boys (4th and 1st grade) have six buckets each. My daughter (Pre-K) has four buckets and I have 3 buckets for stickers, my own office supplies, etc.. We also have an extra bucket with small prizes, which we call the prize drawer. Why the strange division of buckets? Because when we purchased the towers we only had 20 buckets. I didn't want to spend the money on a third tower so I just made it work. Next, year a third tower will be purchased, my daughter will have six buckets and I will have more drawers for supplies and such. Each bucket is assigned the child's name and a number (1, 2, 3 and so on), which I placed on the front of the bucket with washi tape. At the beginning of the year, the kids decided which subject they wanted in each bucket. We moved some buckets around after the first grading period to their liking. It is easier for me to say,"Get out your first bucket or second bucket," then to remember which child is doing which subject. Also, there are times when we have to jump around. If one child is staying on math a little longer than normal and needing my complete attention, then I will tell the other kids to move to a bucket they can complete on their own. Remember, that each subject, bucket, and assignment sheet correspond with one another. Each bucket is filled with any worksheet, office or craft supply, notebooks, etc. that will be needed for the entire week. This leaves zero room for one of my kids to say, "What am I suppose to be doing?" I reload buckets on Friday afternoons. After my kids have completed a bucket they place them at the end of the classroom under our window. They like the feeling of looking at the tower become empty as the buckets are removed. I think it makes them feel like they are really accomplishing something. My oldest son's science bucket - his absolute favorite! My daughter's math bucket with her shape notebook and skip counting cards. I purchased her curriculum from Confessions of a Homeschooler and I cannot say enough good things about it. It is absolutely wonderful! After, each child has completed an assignment, it gets turned into their grading folder. I try to grade as things are turned in or at least at the end of the day. If something is missed on an assignment I call them over to my desk and we take the time to go over the mistake. Once everything checks out okay, the grade goes in red or pink ink in my lesson plan book (later to be put into Excel for report cards) and then back into the specific subject bucket. Graded assignments are always placed on top in the buckets. When the kids pull the bucket out the next day they know to put away the graded assignment before starting that day's assignment. Each of the kids have their own way of organizing their graded work. My oldest prefers a separate folder for each subject. My youngest son likes to keep all of his graded work in one binder divided by subjects. This keeps all of those loose papers (so, so many papers) put away. If you would like a blank copy of our Assignment Sheet, here it is. I love, love, love your organizational techniques!!!!! I heart structure!!!! This is amazing, Elizabeth! I wish I would have used these ideas years ago. Thank you so much. None of my ideas are really all that original, just well organized. Thank you for stopping by!